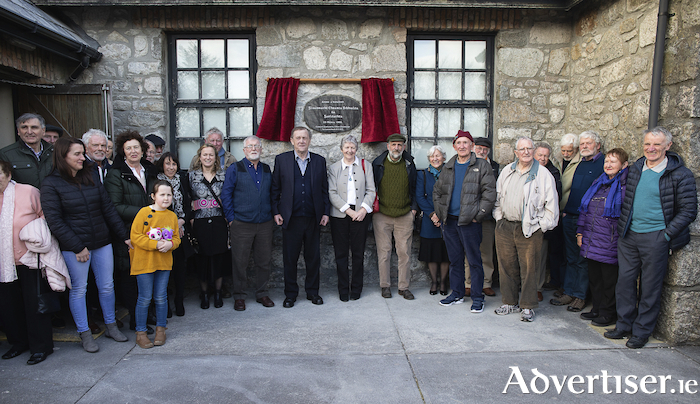 Last Sunday, a plaque was unveiled at Seanscoil an Chnoic, Indreabhán, where the founding meeting took place in March 1969. It commemorated a campaign that involved marches, sit-ins, fish-ins, pickets during a national cement strike, and even sabotage; Taoiseach Jack Lynch’s whirlwind tour of Connemara came to a sudden halt in An Cheathrú Rua during the 1969 General Election, when the tyres of his car came in contact with wood bristling with nails. As part of the movement’s campaign for a State run Irish language radio station, a pirate radio station was set up in Ros Muc. In 1972 the efforts of this civil rights movement bore fruit with the founding of Raidió na Gaeltachta. Some of the same people were involved in setting up a pirate television station in Ros Muc years later, on St Patrick’s Day 1987. It was the first step on the road to TG4. Already in train was an audio-visual industry. When the filmmaker Bob Quinn resigned from RTÉ on principle, he came to Connemara. He, Seosamh Ó Cuaig, and Tony Christofides, a Greek lecturer in UCG, founded Cinegael. From that grew the audio-visual industry, which employs hundreds of people today in Galway city and Connemara. The movement’s campaigning also led to the foundation for a democratic state agency responsible for economic, social and cultural development of the Irish-speaking regions. Údarás na Gaeltachta was formed in 1980. Democratic parish councils were formed throughout Connemara and when particular problems arose public meetings were called and the politicians summoned to attend. However, the over-centralised Irish State always aspired to remove the inconvenience of a democratically elected board to the Údarás, and, in the years after the crushing economic crash Fine Gael and Labour abolished the elected board and appointed its “yes-men” instead. The Dublin urban elite is opposed to the decentralisation of power and money to the regions. In each of the 26 counties, an all-powerful CEO, who reports directly to the Department of Environment, controls the local authority. Councillors have very limited powers. Inevitably such an over-centralised, urban orientated, policy impacts badly on rural Ireland. The most recent example was the decision of the US tech firm HID to move from the Gaeltacht into Galway. Quizzed on TG4 about the relocation of the plant to the city, Minister of State, Seán Kyne [pictured above], told TG4 that the EU prohibited the State from giving extra grants to a company to persuade it to stay in the Gaeltacht. In other words, an industrialist near Dublin airport gets the same grant as the person setting up in the remotest part of Connemara. Sinn Féin’s Matt Carthy MEP, speaking in Furbo recently, noted that, of the jobs being created in the State, 40 per cent are in Dublin, and 60 per cent outside of the capital. He remarked that might sound good for rural Ireland until you realise that those 60 per cent of jobs were spread over 25 counties! Is it any wonder there is rural decline? A solution to this problem, the Telesis Report, written by a US consultancy firm, has been gathering dust on a government shelf since 1981. Commissioned by then taoiseach Charlie Haughey, the key finding was that in order for incomes to rise, there had to be an expansion of export-led industry that was home-grown. “No country has successfully achieved high incomes without a strong base of indigenously owned resources or manufacturing companies in traded businesses," the report noted. Nevertheless, Minister Kyne’s point remains valid. EU treaties have restricted choices governments can make. The EU treaties set the direction and national states must comply. Therefore these days a change of government does not bring a change in policy. Of course, it suits the politicians at home to blame the EU rules. Is it any wonder the electorate has become disenchanted with politics? This development of making national and local institutions of democracy a formal shell is no accident. It is an essential element of the neoliberal project, where decisions in the interests of the one per cent are imposed on the rest of us. Bishop Donal McKeown, whose diocese straddles the border, echoed the professor’s concern about “turbo-capitalism”, which he said is “ravishing society and destroying lives in Ireland”. At the unveiling of the commemorative plaque last Sunday, former county councillor Seosamh Ó Cuaig called for the creation of a new land league, a Conradh Na Tuaithe (Rural League ), to put the “WE” back into Irish rural politics and aim to banish the politics of greed nationally. He noted the rural origins of the “yellow vests” in France and suggested also taking a leaf out of the DUP’s Free Presbyterian handbook on how to deal with a government in need of parliamentary support.